"Who is killing the celebrated bouquinistes of Paris? Then he himself becomes a target of the unknown assassins." With Tom by his side, Marston finally puts the pieces of the puzzle together, connecting the past with the present and leading the two men, quite literally, to the enemy's lair. Just as the killer intended." 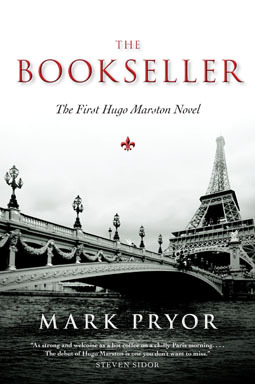 If you are looking for a good thriller, check out The Bookseller, assistant District Attorney Mark Pryor debut novel. Through the story you get an inside look at Paris and how the bouquinistes ply their trade along the Seine river. Marston, frustrated by the French police disbelief that Max was kidnapped, attempts to get to the bottom of his disappearance. Throw in a few shady characters, a love interest, enough twists and turns to confuse even the most intrepid investigator and you have one hell of a story. While reading The Bookseller I could just imagine walking along the streets of Paris. Well worth reading and I'm looking forward to reading the second installment in his Hugo Marston series "The Crypt Thief" coming out mid 2013. Thank you to Prometheus Book for providing me with a courtesy copy of the book.